Before the Three Stooges were their own comedy troupe, they were working as subordinates (stooges) to the comedian Ted Healy, whoâs the true star of this short film. The plot has Healy and his Stooges thrown out of a theater (where they were performing) due to Healy’s constant pursuit of females. Shortly after being fired, Ted quickly tries picking up another girl, only to find jobs for himself and the Stooges at a restaurant, where the girl performs as a singer. 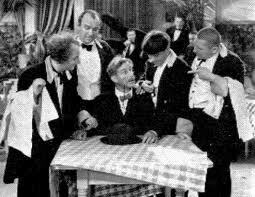 In addition to the typical Three Stooges mayhem, there’s singing by different acts, ending with Healy and his Stooges thrown out yet again. At best, Beer and Pretzels can be considered as prehistoric Three Stooges – not bad, but way too much “other” stuff. It’s available on DVD, as an extra on the Flying Down to Rio DVD, of all things. Stage Manager: Get out in that gutter where you belong! Ted Healy: I’ll go out in the gutter, but I don’t belong! Moe Howard: Let me tell you a thing or two, if it hadn’t been for you, we wouldn’t be thrown out of these theatres, always foolin’ around with the girls instead of rehearsin’ the act! Larry Fine: Yeah, I heard ya tell that girl you were gonna put her name in electric lights! Ted Healy: Is that what I said? Ted Healy: you know, I was thinking of something else. Let me tell you, from now on, I am serious, no more girls, strictly business! Larry Fine: You mean, that? Ted Healy: If I am lying, I hope you drop dead! Ted Healy: [to Larry] Hee-hee, you haven’t got long to live, son! Ted Healy: Hey, you know, youâre a beautiful creature, how ah, how would you like your name in electric lights? Ted Healy: So would I! Ted Healy: [to Bonnie] Did you ever hear of, Garbo and Harlow? Moe Howard: [to Ted] Did you ever hear of a bowl of soup? Curly Howard: Yeah, when do we eat?